The Auditorium and the adjoining Music Conservatory G.P. da Palestrina is situated in the area among the streets Bacaredda, Sant’Alenixedda and Efisio Cao di San Marco, in a square named after Ennio Porrino. Born in Cagliari, Porrino directed the Music Conservatory of Cagliari from 1957 to 1959. Internationally renowned musician, he is still remembered for his compositions recalling the most known popular themes of Sardinian music. 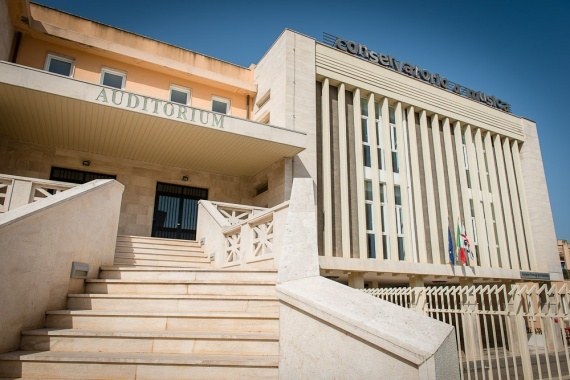 Both the Auditorium and the Conservatory were designed by the Engineer Paolo Porceddu (Cagliari 1921-1999). The project, approved in 1964, included the “school branch” and the “Auditorium branch” as two different parts of the same building, whose construction started in 1967. The school branch was accomplished in 1973, but it was already being used starting from the beginning of 1971, when the Conservatory moved from piazza Palazzo soon after the annexed public school. At the time of its construction the new building, of an imposing and solemn style softened by some architectonic patterns inspired to music (organ pipes for the Conservatory and a keyboard for the Auditorium), was considered the most modern Conservatory in Italy and among the most remarkable ones in Europe, especially for the perfect acoustic isolation of its classrooms. The construction of the new Conservatory promoted and enhanced musical studies, as it was and will always be necessary in a town of artistic vocation like Cagliari. Nowadays the Conservatory has become Institute of Higher Education in Art and its activity has grown over the decades as well as the number of students, that has reached 1000 inscriptions. Text and pictures courtesy of the Music Conservatory G.P. da Palestrina.